There is just something about the Calgary Stampede. Even this year, when I had to leave Rocky at home and only helped out, it’s still always a special experience. As always, when trying to organize the Greatest Outdoor Show on Earth, there are going to be glitches. This year, it was the outdoor part coming indoors, as we arrived to find a flooded barn after a night of heavy rain. That resulted in a few hour delay while we waited in our vehicles (trying to stay out of the rain!) or helped push water in the barn. The staff was great to us, delivering hot coffee and warm cinnamon buns to everyone in the line up, giving constant updates on progress, and pulling people out of the line to start unloading as soon as their stalls were dried out and set up for them. It was all hands on deck in the ag building that morning, with office staff and management down there manning brooms and shovels. Cries of “hurry, hurry hard” encouraging sweepers and laughter could be heard as everyone pulled together to get horses out of trailers and settled into dry stalls. Almost everyone, anyway. Of course there are always a few people who choose to be mad about a situation, but mostly I think we all appreciated everyone’s hard work. Mom is still awaiting surgery to fix her separated shoulder, so luckily my aunt, Carrie, came down to help me with the setting up of curtains etc. And then after first discovering that the offsite trailer parking no longer has a shuttle and having to hitch a ride back to the grounds, we realized we’d forgotten the costumes we were planning to bring for our friends, Tyson and Emily, to wear in the Youth Costume class … that was at 5:30 this afternoon. So Mom hitched another ride back to the offsite lot, took the truck and trailer home, picked up the costumes and came back in a more reasonably vehicle – that would then be allowed to park in the lot that HAS a shuttle. 😉 Carrie and I realized about the time we expected her back that she wasn’t going to be able to carry both suitcases of costumes with only one good arm, I tried to call but didn’t get her … and about then she got back, followed by Jordan carrying the costumes for her. 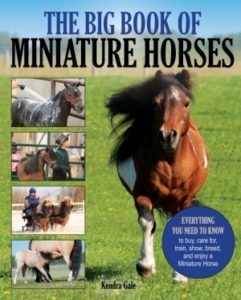 Miniature Horse friends to the rescue! And it was in time for Tyson and Emily to dress their horses up as the Hereford bull and bucking bull for the costume class! Carrie and I bathed Zac and Duke once we got everything set up and they were measured – they didn’t show until Thursday, but they were dirty and it didn’t seem right to leave those grubby beasts on display. 😉 We didn’t clip Zac, because he’s very allergic to mosquito bites, 22 years old, and only going in one class where he wears a lot of shiny harness. But it did mean he took a bit longer to dry after his bath. Once he fluffed up though he was quite adorable and everyone who petted him was so excited about how soft he was. At Stampede they have people there to help get livestock through the crowds safely – they have reflective vests and little wands made out of pool noodles to help direct traffic, and they’ve earned the somewhat unfortunate moniker of “noodle people”, at least among the Miniature Horse people. They do a great job of helping get horses from the wash rack back to their stalls, or escorting driving horses to the show ring, but they’re very vigilant and I think Zac and Duke are legitimately confused when people DON’T come over and pet them – after as many Stampedes as they’ve been to, making new friends is just part of the deal! I was over by the hitching ring chatting with Crystal (who happens to also be my veterinarian) about driving obstacle, when my phone rang. Christine, who stalls with us, had noticed Zac was acting colicky. I asked Crystal to stop by when she was finished with her classes and hurried back. He was definitely not feeling well: looking at his side, kicking at his belly and wanting to roll. I got him up and took him (and Duke because he wouldn’t be left behind) for a brisk walk down to the river, a bit of a trot up and down the grass bank, and back to the barn. He passed some manure on the way, and there was a fresh pile in the stall, which was a good sign, but still he seemed dull and uncomfortable. Crystal came over and checked on him, and suspected a bit of spasmodic gas type colic. He wasn’t in distress based on his vitals, so we decided more walking and monitoring him for a bit was the way to go. I think Crystal cured him with her magic examination, because he quickly started looking brighter, scratching with Duke while out on our walk, and taking me for a walk instead of the other way around. Back at his stall he was cranky that we’d taken his supper away (as a precaution until we were sure the colic had passed), and we finally felt comfortable leaving him … after first asking Alicia (who stays on site) to check on him when she came to do a bed check on her horses. Huge gigantic thank you to everyone who helped out, especially Dr. Crystal Lee who was supposed to just be showing her own horse, not being in vet mode! By morning, Zac was back to his usual bright eyed self, and we were ready for a busy day of showing … well, not me, but I managed to keep quite busy regardless. There is something about the Stampede show that lends itself to memorable moments. First thing in the morning was Roadster, where I got to cheer on my friend Jodi, who was very bravely going in her first driving class without her heart horse, who she lost after a lifetime together last summer. 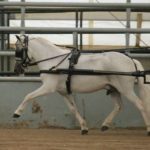 We all cried for Indian, who is so missed, but Shadow, who is a talented and honest driving horse, gave her a great drive in his memory, and we know Indian was watching over them. Next there was a special presentation about the first foal we ever bred, Circle J Champs Lil Chief, who was at the show at 33 years of age with his lifetime people, the Locke family, and looking AMAZING, which of course made me teary to see. 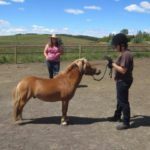 The Stampede is one of the very rare occasions where we actually have an audience for a Miniature Horse show, and sometimes it’s a BIG audience. Trying to keep them engaged is a full time job, and in the Agrium they have both an announcer and a colour commentator to try and explain to the audience what’s going on and keep them engaged. Since there has to be a warm up for the driving horses between driving divisions, that’s a dead space where it’s super easy to lose all your crowd. 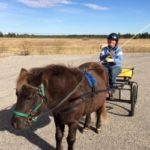 They’d asked me to do a couple interviews, one talking about my Grandad’s eight horse hitch (which really turned into quite a bit just about our family’s journey into Miniature Horses) and then one about my upcoming book, which was fun for me. After filling in a bit of time during warm ups I got to head for Jodi in Versatility, which is always fun to be a part of, and in the afternoon I actually got to show a horse since my friend Christine had two yearling fillies entered. At the last second I talked her into switching horses, as I was slated to show the filly that had done quite a bit of winning at the last show, and I thought that if she was going to win here at the “big show” it would be much more special if Christine was showing herself. My gamble paid off, and she showed her filly to Canadian National Champion Junior Mare – so exciting! The filly I showed did well too, it was fun to actually have a chance to get out there! That night, we totally could’ve gotten home in time to get a proper night’s sleep, but by the time you visit your way out of the barn and ride the shuttle and drive home and do chores – it was a pretty darn short night. Thursday Mom had to work in the morning, so I went in on my own, and looked after our boys and Christine’s crew as she had to run a sick little boy to the doctor. Then the offsite lot struggles began again as I had to go meet Mom there when she came in with the truck and trailer (which meant walking from the barn, riding the shuttle, driving to the offsite lot – I only got lost once – picking her up and repeating the whole process to get back to the barn) and by then it was about time to start getting the hitch ready for their class – our one class of the whole show! Carrie brought my great aunt Joan down with her, and it was great to have all their help to get the team ready. Carrie painted their feet, and I was hanging out with them while they dried. People love to pet, and lots of the horses down there aren’t cool with attention, so I always say yes when people ask – Zac and Duke truly don’t mind, they’ll even get jealous if the other one is getting petted and not them. Three people were standing there, hands in front of their chests, looking at Duke. They were grown up people, but looked exactly like the little kids who have been told by their parents not to touch, and they looked just as excited as a toddler would when I told them they could pet. The one guy asked, super excited, if he could take a selfie to send his niece and “blow her mind” – of course he could! And while I knew Duke wouldn’t mind a selfie, I didn’t know he was a selfie pro, maybe he’s been chatting with Johnnie as he leaned in, ears up, like he knew exactly what the game was. So naturally, the next thing you knew there was a line up of people waiting their turn for a selfie. Duke had a great time! We were just about ready to hook when the word came down that the show before us in the Agrium Western Events Center was running behind and we were going to be late, so we waited until we got the word rather than have to wait in the hot sun and busy alleyway behind the building. When it was finally time to head over, both hitches went out at once and then we snuggled into the shade along the fence as much as possible. Poor unclipped Zac was HOT and I used me and my hat to shade him. About the time they were ready for them in the show ring, the rodeo let out. For some reason, they let the grandstand empty into that already very busy alley, and thousands of people were streaming past which made a bit of a tricky trip across to the doorway – I don’t think we ran over any toes. 😉 Crowds of people are not that good at moving out of the way of horses that are too short of them to see. LOL! Because of the delay they didn’t have the arena packed very well after the the working cow horses were in there, so it was pretty deep and both teams struggled with it, but they both did very well under the circumstances. My favourite part was that the Indian Princess arrived to make the presentation of the Lord Sterling Cup and took a ride on both wagons – I love, love, love the Indian Princess, all the beautiful outfits and the beaded crown, so anytime I get to see her I am as excited as I was as a little girl! After the hitch class I was recruited to fill in the warm up for the driving championships, and since all four driving divisions were coming in I tried to give the (now pretty significant) crowd an idea of the differences between the classes and what they could watch for. And they didn’t seem to be leaving in droves so I guess I was interesting enough haha! Zac attended his first Stampede at 3 months of age, he is 22 years old this year, and he sure didn’t miss many – not sure if we showed him as a yearling, but by the time he was three he was my brother John’s main show horse and he’s been there with us ever since. Despite his vast experience, every single time we start taking down stall curtains and packing up he starts having a fit, reminding us constantly not to forget to pack him as well. Maybe he figures that if he hadn’t always reminded us that he wanted to go home too, we would’ve left him behind. It’s funny, no one else is ever as concerned as Zac is. It was long dark by the time we got home and everyone fed and settled in for the night. And now begins the resting up! Stampede is always exhausting, but it’s worth it. With other things taking my time these days, I can see I’m going to have to scale back on my showing, but the Stampede show is a tradition and I can’t imagine missing it. 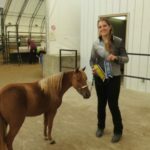 Excellent wrap up – thanks for sharing your Stampede experience! Outstanding job being the color commentator and keeping the crowd entertained and educated in between classes!!! !